A fast, secure and highly scalable solution for the financial institutions to intelligently extract, standardize, enrich data from multiple sources, and significantly enhance functionalities thereby improving TAT. D-Rive from Dion is a financial data extraction and standardization technology solution that drives confident business decisions. An innovative, intelligent technology solution that automates the process of extraction, transformation, and distribution of data from structured as well as unstructured sources. The solution has the capability of converting scanned documents, images into editable & searchable data by using proprietary engine. It uses a highly automated data extraction workbench and provides the ability to extract every line-item from any financial document such as annual reports, fact-sheets, and analyst models amongst others. The extracted data undergoes a transformation to compute standardized data, ratios, non-reported numbers and more. The transformed data is presented through a web portal with source linking for 'click-through' auditability and an excel add-in to allow for further manipulation. D-Rive also offers automated rule-based data quality verification, classification-based transformation and standardisation to allow simplified data comparisons. D-Rive is a highly configurable rules driven (for data extraction, validation, and transformation) standardization platform. With modular interface, it can be customized as per business needs. Named entity management, data point – attribute association, Open NLP module for text-specific parsing. The solution checks for data quality giving results instantly. It also gives an option to review and edit data manually. D-Rive is capable of handling data in multiple formats -HTML, DOC, XLS, ASCII, PDF and more, and the data extraction process handles special characters and uncontrolled variables. Extracted data can be populated on Web-services (XML, JSON), Excel, CSV, User-app or other analytic applications. D-Rive also gives seamless integration facility with other tools. D-Rive’s cleansed and standardized data leads to better decision making, auditability and stronger review process. D-Rive provides consistent and accurate results based on validation rules defined. Faster processing and extraction of data from multiple documents with high throughput drives efficient business processes. 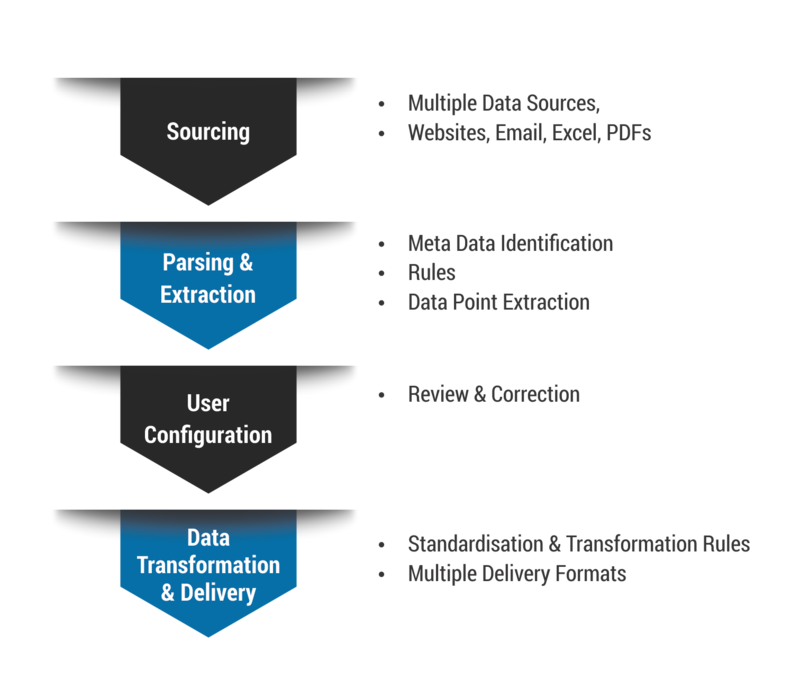 The complete data standardization process is automated with D-Rive, which reduces manual data management process. Speak to our experts to learn more about how our advanced data extraction and standardization software can improve your Business Processes.